The Flight Deal | Practical Travel Tips: Hong Kong. Hong Kong is the city we visit the most internationally – collectively, the team is there at least 7 or 8 times a year. We wrote a quick guide for Hong Kong a few years ago. Here’s another take on Hong Kong from Jim. Jim “The Travel Organizer,” who last wrote about Austin, San Antonio, Valley of Moon, California, Dubrovnik, Croatia, Split, Croatia, Krk, Croatia, Koper, Slovenia, Mendocino County, California, Auckland, Oslo, the small German town of Speyer and Deidesheim, Oahu, Napa Valley, Venice, Singapore, Bangkok, Sonoma County and Myrtle Beach, and here are his tips should you visit. Hong Kong has so much to offer that it’s way beyond impossible to address even a small fraction of what makes this former British Colony such a special place to visit in just a few (web)pages. In this report, I’ll focus on some of the highlights for the first time visitor. While Singapore’s Changi airport has been voted the “World’s Best” for six years in a row, Hong Kong International Airport, the motto for which is “Where Amazing Journeys Begin,” doesn’t lag far behind. After a long flight, any passenger can freshen up in the free, 24-hour shower facilities near Gate 22 on the Arrivals level of Terminal 1 (T1). Tip: Pack a cheap/old towel (doesn’t need to be full-size) and dispose after drying off rather than repacking a wet towel. If you have a Priority Pass membership (a benefit of numerous credit cards), you can access the 24-hour Plaza Premium Arrivals Lounge below the Airport Express station just after exiting the Arrivals Hall for its showers, noodle bar, computer stations and free – but not terribly fast – Wi-Fi. If HKG is your connecting airport and you don’t have an onward boarding pass, you’ll need to proceed to your airline’s transfer desk (there are 4, 3 in T1 and 1 in the Midfield Concourse). Boarding pass in hand, you can relax and unwind in the complimentary “Relaxation Corner” near Gate 23 (T1) when it reopens in April. Massage services will be available here for a fee (roughly $32 for 30 minutes or $25 for 20 minutes). If you find yourself with several hours to kill before your flight, you will probably be surprised to learn that the largest IMAX screen in Hong Kong is at the airport; follow signs from the Arrivals/Departure Halls in T1 to the underpass leading to Terminal 2 (T2). Tip: Be sure to check show times at the theater’s website. Adjacent to the IMAX theater is the free Aviation Discovery Center and, through it, access to the Skydeck for an open air view of both runways (about $2). OneWorld Emeralds, regardless of class flown, can access two of the best first class clubs in the world: Cathay Pacific’s “The Wing” (airside, turn left immediately after exiting the security checkpoint on the left side of the departures hall) and “The Pier” (a long walk or short train ride…one way only…to the concourse serving gates 60-71). While “The Wing” offers luxurious “cabanas” and an awesome noodle bar, I’m partial to “The Pier” near gate 63. It features a full service restaurant, free, 20 minute foot or shoulder/back massages and private, quiet day suites (dubbed “The Retreat”) with tarmac views. 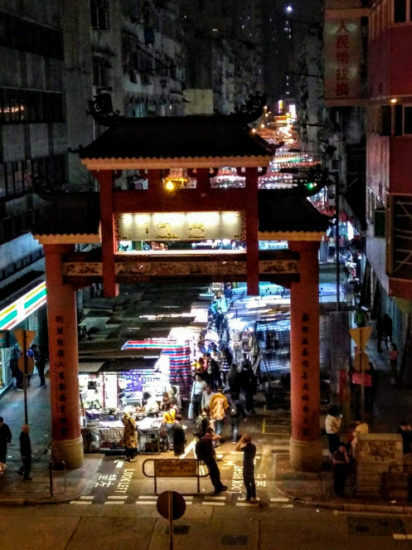 The airport, which is more than 40 km from Kowloon and Hong Kong Island, offers a plethora of easy connections to all the action in the city. The choice of which mode to use is a function of cost, time and proximity to one’s destination. Single trip tickets for public transit can be purchased but if your travels are likely to take you back to Hong Kong or if you will be there a few days, buying an Octopus Card makes good sense. The Octopus Card is a rechargeable, stored value card which can be used to pay for almost all trains, buses, and ferries as well as supermarkets, convenience stores, fast food outlets, cinemas, etc. Arriving passengers can obtain an Octopus Card at the MTR (Mass Transit Railway) Customer Service Center just in front of the platform to board the Airport Express (see below). Cost: $105 HKD (@$13.38 USD) one-way to Kowloon, $115 HKD (@$14.65 USD) one-way to Hong Kong Island, $5 HKD discount if using an Octopus Card. Note: Normally, there’s no senior discount (“concession”) but there are occasional promotions; check the MTR website. Frequency of service: Every 10 minutes. Time to city center: Kowloon station (22 minutes), Hong Kong station (24 minutes). When you get to Kowloon or Hong Kong station, you’ll need to wait for and ride one of the free shuttle buses to major hotels, metro/subway stations, ferry terminals, etc. Note: While you can use a credit card to purchase single use tickets from vending machines, Octopus Card transactions are cash only! (Editor’s Note: Use Klook.com for Airport Express tickets is cheaper than using Octupus). Air conditioned, double-decker city buses with free Wi-Fi are likely to get you closer to your hotel (especially if it is in Kowloon) than the Airport Express. They depart from the airport’s Ground Transportation Center which is down the ramp to your right after exiting the Arrivals Hall. Cost: Varies by final destination; you’ll probably use one of the 6 Cityflyer routes serving Kowloon and Hong Kong Island; one-way prices range from $33 HKD (@$4.20 USD) to $48 HKD (@$6.12 USD). Frequency of service: About every 10 minutes during the day, about every 30 minutes at night. Time to destination: 45-75 minutes, depending on route and traffic. Tips: (1) If you add the time spent waiting for and riding the Airport Express’ free hotel shuttle buses, the public buses can turn out to be the fastest as well as the least expensive option. (2) If you are using a senior Octopus Card, fares are cut in half! (3) You may be able to ride directly to your hotel if it is served by a Vigor Airport Shuttle for $140-$150 HKD (@ $17.84-$19.11 USD) or Hotelink (call 852.3193.9333 or inquire at Counter B01 in the Arrivals Hall). Frequency of service: Every 30 minutes. Taxis are color-coded! You’ll need a red taxi if your destination is Kowloon (@ $270 HKD or @ $34.40 USD) or Hong Kong Island (@ $370 HKD or @ $47.14). Each piece of luggage is an additional charge of $6.00 HKD ($0.76 USD) and, while tipping is not required, an additional $10 HKD (@ $1.27 USD) is customary. Time to destination: 30-60 minutes, depending on route and traffic. Limousine service from Vigor is the most comfortable but also the most expensive ($720 HKD or @ $91.73) option – and it won’t get you to your destination any faster than less expensive options. While not technically illegal in Hong Kong, Uber operates in a grey area and, because it doesn’t offer either a cost or time advantage, may be best to avoid. There’s a lodging option for every budget in Hong Kong – from hostels to luxury hotels. If you can afford a little splurge, you can’t go wrong choosing the Intercontinental Hong Kong. Its location is ideal in so many ways. Floor-to-ceiling windows in its public spaces and almost 2/3 of the guest rooms offer panoramic views of the Avenue of the Stars, Victoria Harbor and Hong Kong Island. The Hong Kong Museum of Art, Space Museum and Cultural Center are adjacent its property. Getting there is a breeze; get off the A21 Cityflyer bus at the East Tsim Sha Tsui/Salisbury Road stop (stops are announced in English) and take the underpass to the hotel’s grand entrance. There’s a smartphone in every room one can use to make free calls to over 20 countries and regions as well as explore the city’s wonders with the pre-loaded city guide and interactive maps using its free 4G data connection. The Intercontinental Hong Kong features 2 Michelin-starred restaurants: the jade-themed Yan Toh Heen (2 stars for 5 years in a row! ), serving authentic Cantonese cuisine and Rech (1 star in 2018 and 2019), modeled after one of the most famous seafood restaurants in Paris. The Club Intercontinental Lounge, located on the 2nd floor overlooking Victoria Harbor offers a simply sumptuous breakfast featuring a massive buffet of cold and hot dishes plus a choice of any 2 items from the printed menu at each table, afternoon tea with pastries and evening hors d’oeuvres with premium wine and spirits. Any guest can enjoy the luxury of the Club Intercontinental Lounge for $1,180 HKD (@ $150 USD) single, $1,480 HKD (@ $186 USD) double. While that may sound pricey, it wouldn’t be difficult for a couple to spend that much or more on a day’s meals in nice Hong Kong restaurants. A less expensive but conveniently located option is the Shamrock Hotel at the intersection of Nathan Road and Bowring Street (@ $100 USD/night inclusive of buffet breakfast, Wi-Fi and wired Internet connection and all service charges). Again, the A21 Cityflyer bus is your best bet to get here. Get off at stop #11 (Prudential Center); the hotel will be almost directly across the street. From the Shamrock it is just a short 5 minute walk to Temple Street Night Market (see below). 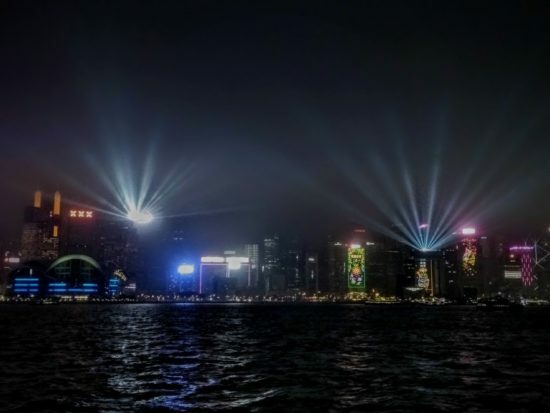 Each night, the skyscrapers on both sides of Victoria Harbor become a canvas for the “World’s Largest Permanent Light and Sound Show” (Guinness Book of World Records). This free show begins at 8:00pm and lasts about 10 minutes. One of the best places to view this display is from the waterfront promenade between the Avenue of the Stars and the Hong Kong Cultural Center (Kowloon side of the harbor). You could also view the show over a drink in the Lobby Lounge of the Intercontinental Hong Kong which is immediately behind this vantage point but you won’t hear the soundtrack recorded by the Hong Kong Philharmonic Orchestra unless you dial 35-665-665 on your mobile phone. For an unforgettable experience, take the Star Ferry’s “A Symphony of Lights Tour” ($230 HKD or @ $29.30 USD for adults, $200 HKD or @ $25.48 for children and seniors). Note: Thin clouds, which often hang low over the harbor, have the effect of muting the vibrant colors (as in the picture here). Keep your fingers crossed for a crystal clear night. Much like “A Symphony of Lights” on an overcast evening, Temple Street Night Market can turn out to be a disappointment, depending on one’s expectations. For 5 blocks, stretching from Jordan Road to Kansu Street, stalls from which everything from luggage to electronics are being sold line both sides of Temple Street in the Jordan neighborhood. Since the action here ramps up after dark, this is a good place to have a meal along with your sightseeing and shopping. Manakamana Nepali Restaurant (165 Temple Street, 4.5 stars, ranked in the top 1% of Hong Kong restaurants on TripAdvisor) will satisfy a craving for momos or curry. Prices are extremely reasonable ($42 – $99 HKD, @ $5.35 – $12.61 USD). But save room for dessert at Mammy Pancake (219 Temple Street, 4.5 stars and ranked in the top 6% of Hong Kong restaurants on TripAdvisor) which specializes in egg puffs and unique pancakes. Yes, it’s crowded. Yes, a lot of the stuff being sold is junk and cheap knock-offs. Yes, some of the smells can be borderline offensive to Western sensibilities. But if you accept it for what it is, it’s fun and all those people can’t be wrong! Everyone has to visit “The Peak,” Hong Kong’s #1 tourist attraction, for its iconic views of Hong Kong Island, Victoria Harbor and Kowloon! The Hong Kong MTR station (last stop for the Airport Express) is connected via subterranean walkways to Central MTR station. In Central station, make your way to the J2 exit and walk up to ground level. From the J2 exit, it is only a short walk to the Peak Tram terminus. One-way tickets to the Peak Tower cost $37 HKD (@ $4.71 USD) for adults and $14 HKD (@ $1.78) for children and seniors; roundtrip tickets for adults run $52 HKD (@ $6.62 USD) for adults and $23 HKD (@ $2.93 USD) for children and seniors. But…this doesn’t get you to the “tippy-top” – Sky Terrace 428! That will cost you another $52 HKD for adults and $26 HKD for children and seniors. Tips: (1) Lines to take the Peak Tram up to Victoria Peak at sunset can be really long! (2) If you’re set on paying the additional price to gain admittance to Sky Terrace 428 and haven’t purchased your tickets online ahead of time (inadvisable since bad weather could ruin the view you paid for), make sure you have enough local currency; credit cards aren’t accepted for payment. (3) You can get almost the same view by following the exit signs after getting off the tram and taking Findlay Path to a second viewpoint without the crowds or the additional fee. 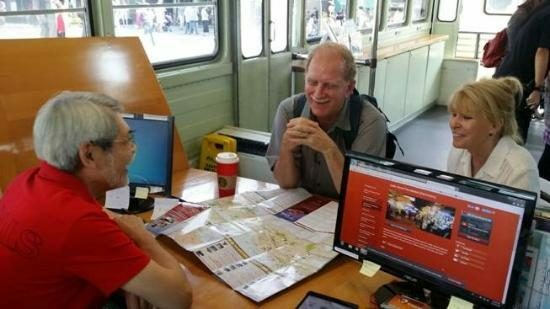 Finally, there’s no better way to discover this city the way locals see it than to sign up for one of the incredibly diverse “Hong Kong Pals” programs presented by the Hong Kong Tourism Board. Whether your passion is bird watching, photography, gastronomy or finding authentic paper art souvenirs, there’s a program for you! These free programs are presented at the Tourism Board’s Visitor Centers; appointments are required.